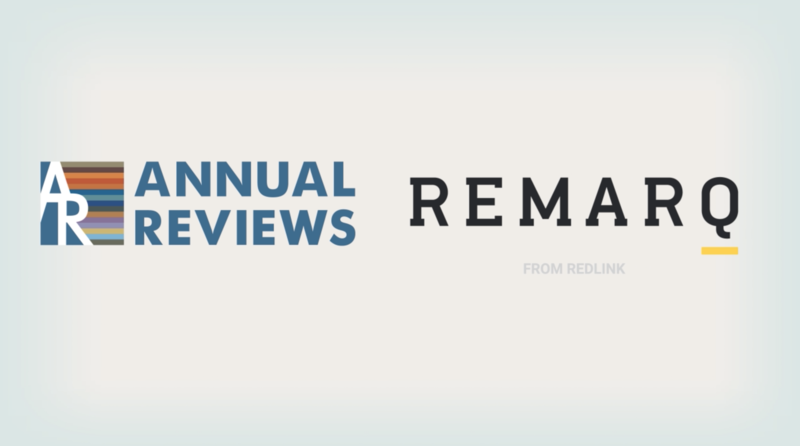 Remarq, the newly launched editorial engagement and researcher collaboration tool from RedLink, is now live across the complete Annual Reviews journal collection. August 29, 2017, Westborough MA, USA – RedLink is pleased to announce the launch of Remarq® on the complete collection of 47 journals from nonprofit publisher Annual Reviews. Remarq is a new tool for the publishing community offering annotation, commenting, article sharing, and collaboration, all on the publisher’s site and utilizing the version of record. Remarq keeps researchers and readers engaged by providing a powerful and smoothly integrated set of tools that support authors, editors, and readers. By facilitating informed conversation on the version of record, Remarq offers the opportunity to leverage author interaction, including providing additional information, data, or other assets related to the article, creating a rich environment for collaboration. Annual Reviews joins IOP Publishing and Canadian Science Publishing as early adopters of Remarq, which launched its first version in mid-May 2017. Annual Reviews is a nonprofit publisher dedicated to synthesizing and integrating knowledge for the progress of science and the benefit of society. To find out how we create our highly cited reviews and stimulate discussion about science, please watch this short video. Members of the media can visit our Press Center to sign up for journal access.